Today, at 73, Kabat-Zinn’s restful, lined face shows no scars from that protest outside a police station, when a trip canvassing support for a nationwide university strike boiled over into violence,leaving him with stitches. He sits beneath the statue of Mahatma Gandhi on Parliament Square in London taking a breather after going straight from an overnight flight out of Boston into a 90-minute talk to a gathering of international parliamentarians about how he thinks mindfulness could – to put it bluntly – change the world. The once “very macho” anti-war activist who raged against MIT’s role in nuclear weapons research is the catalyst behind the west’s mushrooming interest in mindfulness meditation, having reimagined Buddhist contemplation practices for a secular age almost 40 years ago. With others, he pioneered an eight-week mindfulness-based stress-reduction course at the University of Massachusetts Medical School for patients with chronic pain, harnessing the fundamentals of mindfulness meditation as taught by the Buddha, but with the Buddhism taken out. “I bent over backwards to structure it and find ways to speak about it that avoided as much as possible the risk of it being seen as Buddhist, new age, eastern mysticism or just plain flakey,” he says. Kabat-Zinn had been meditating since 1965, but had no compunction in playing the Buddhism right down. “I got into this through the Zen door which is a very irreverent approach to Buddhism,” he says. He talks a lot about dharma, the term for the Buddha’s teaching, but he’s not a Buddhist and remarks that to insist mindfulness meditation is Buddhist is like saying gravity is English because it was identified by Sir Isaac Newton. The UMass Stress Reduction Clinic opened its doors in 1979 and taught people with chronic back pain, victims of industrial accidents, cancer patients and sometimes paraplegics. Kabat-Zinn has defined mindfulness meditation as “the awareness that arises from paying attention, on purpose, in the present moment and non-judgmentally”. By focusing on the breath, the idea is to cultivate attention on the body and mind as it is moment to moment, and so help with pain, both physical and emotional. “It often results in apprehending the constantly changing nature of sensations, even highly unpleasant ones, and thus their impermanence,” he says. “It also gives rise to the direct experience that ‘the pain is not me’.” As a result, some of his patients found ways “to be in a different relationship with their pain” while others felt it diminish. The title of his 1990 bestseller about the clinic captures his approach to accepting whatever life throws at you: Full Catastrophe Living. Now, in 2017, Kabat-Zinn vibrates with an urgent belief that meditation is the “radical act of love and sanity” we need in the age of Trump, accelerating climate change and disasters such as the Grenfell Tower fire. He has a platform to build on. Mindfulness courses ultimately derived from his work are now being rolled out in the UK to school pupils, convicts, civil servants and even politicians. It is prescribed on the NHS in some areas to prevent recurrent depression, with 2,256 people completing eight-week courses last year. The course reduces the likelihood of relapse by almost a third, according to an analysis of nine trials. In the US, the NBA basketball champions, Golden State Warriors, are the latest poster boys for the practice after their coach, Steve Kerr, made mindfulness one of the team’s core values. Supporters such as Willem Kuyken, a professor of clinical psychology at Oxford University, even suggest that Kabat-Zinn’s pioneering work could one day see him mentioned in the same breath as Darwin and Einstein. “What they did for biology and physics, Jon has done for a new frontier: the science of the human mind and heart,” says Kuyken. South African children at Rosewood Primary school take part in a free meditation class, in Bonteheuwel, a Cape Town suburb with significant gang problems. But mindfulness, Kabat-Zinn figures, must now be harnessed in a bigger way than so far seen, to do nothing less than challenge the way the world is run. This latest mission is why he has flown into London to speak to parliamentarians from 15 countries about how to act more wisely. There are signs many others agree with its potential. Globally, 18 million people subscribe to the Headspace app, practising mindfulness meditations through their headphones. In the shops, ranges of mindfulness clothing – not least “drop of mindfulness” tights (the only thing mindful seems to be the brand name) – colouring books and even dot-to-dot puzzles testify to the idea’s growing ubiquity – even if Kabat-Zinn derides much of this as “McMindfulness”. His work has attracted its share of sceptics, such as Miguel Farias and Catherine Wikholm, authors of The Buddha Pill, who caution that mindfulness is no cure-all and warn of a dark side if not taught correctly. Wikholm, a clinical psychologist, has said that “the fact that meditation was primarily designed not to make us happier, but to destroy our sense of individual self – who we feel and think we are most of the time – is often overlooked in the science and media stories about it”. There have also been 20 published case reports or observational studies where people’s experiences of meditation were distressing enough to warrant further treatment, according to a recent study. They include “meditation-induced” psychosis, mania, depersonalisation, anxiety, panic and re-experiencing traumatic memories. Kabat-Zinn and other highly experienced teachers point out that these are rare incidents and mostly relate to intensive retreats rather than the routine courses where meditators practise for perhaps half an hour a day. But he also admits that “90% of the research [into the positive impacts] is subpar”, with major studies still needed. Kabat-Zinn has just written a paper arguing that amid “the ascendancy of Trump and the forces and values he represents”, “endemic racism and police violence” and “persistent social and economic injustices … this may indeed be a pivotal moment for our species to come to our senses ... mobilising in the mainstream world ... the power of mindfulness”. He is at the House of Commons to make his case, but first he must get past the guards at the airport-style security system. While everyone else unpacks their laptops for the scanner, Kabat-Zinn produces a pair of ancient-looking copper meditation chimes, to the complete bemusement of the guard, who tries to confiscate them. When Kabat-Zinn explains they are for meditation, the puzzlement only deepens, as security staff gather to assess the threat. Finally, when he mentions it is for mindfulness, there is a flash of recognition and he is waived through. It is a moment of satisfaction for Kabat-Zinn: if a security guard knows the score, it must be catching on. Meditation is the “radical act of love and sanity” that can help manage the fear and aversion he believes underpin so many of the world’s problems. The Grenfell Tower disaster that claimed around 80 lives was partly down to an absence of mindfulness – “deep and authentic listening” – by decision makers who clearly felt an aversion to the complaints of residents. 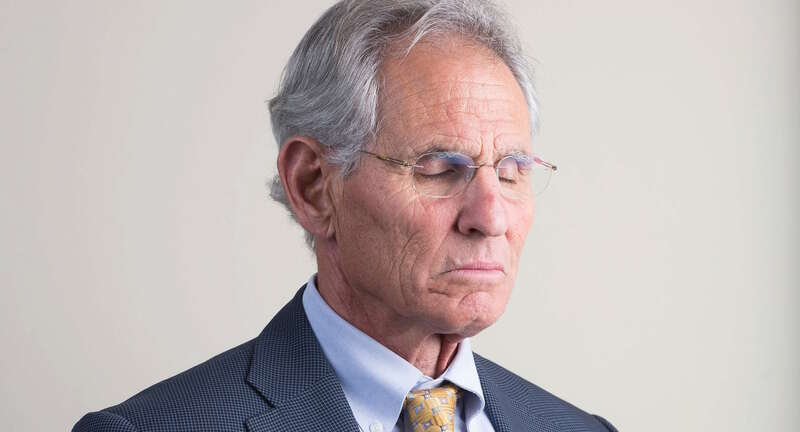 Kabat-Zinn was born into a non-practising Jewish family and raised in upper Manhattan, near where his father worked as a scientist at Columbia University. It was rough and tough on the streets around Washington Heights and he jokes he is “the world’s most improbable meditator – a street kid from New York”. He started meditating while studying molecular biology at MIT in 1965 when a talk by Zen Buddhist Philip Kapleau “took the top off my head”. In 1979, married with children and working at the University of Massachusetts medical school, he had a 10-second “vision” on a meditation retreat in the woods 80 miles west of Boston. “I saw in a flash not only a model that could be put in place, but also the long-term implications,” he says. Kabat-Zinn foresaw mindfulness clinics spreading to hospitals and clinics with thousands of practitioners earning a living in a good cause. “Because it was so weird, I hardly ever mentioned this experience to others,” he says. “But it was so compelling I decided to take it on whole-heartedly as best I could. 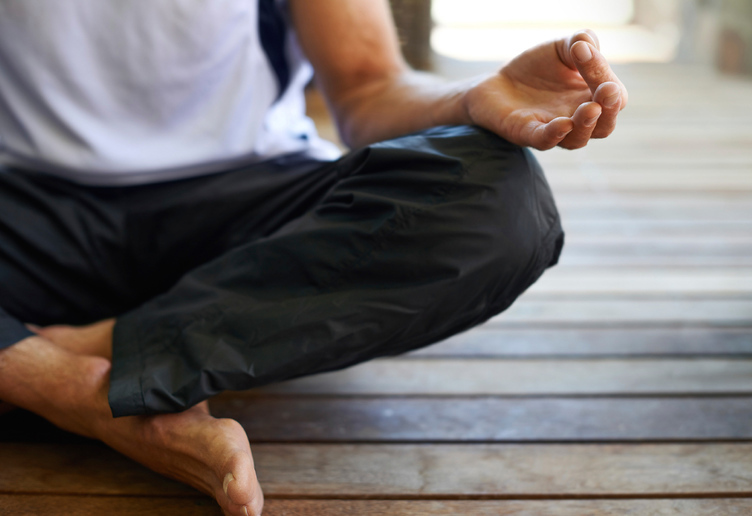 Corps of Cadet Recruits train in transcendental meditation to prevent PTSD by providing coping tools before exposure to combat or stressful situations. Anyone who has tried to meditate knows how hard it is when the mind keeps wandering into thoughts, sometimes trivial, sometimes not. The difficulty people in chronic pain must have faced in embracing the elusive quality of attentiveness cannot be overestimated. But in Kabat-Zinn they had an experienced teacher. For more than 30 years, “every morning at five o’clock”, he would do yoga and then sit on his cushion and meditate. He stayed with his eight-week stress-reduction programme until 2000, spreading its influence through books, guided meditation CDs, teaching at retreats and endless conferences. In 2002, Welsh psychologist Mark Williams worked with colleagues at Cambridge and in Toronto to combine the US programme with cognitive behavioural therapy (CBT) to form an eight-week mindfulness-based CBT course that, in 2004, was recommended for prescription on the NHS for recurrent depression. Williams taught mindfulness to the comedian Ruby Wax at Oxford University when she was looking to tackle her depression. She then popularised it through her 2013 book Sane New World. Mindfulness-based cognitive therapy (MBCT) has been shown to be at least as effective as antidepressants at preventing relapse and, in a two-year trial by Willem Kuyken’s team, 44% of the MBCT cohort relapsed compared with 47% on pills. In one trial of 173 people, it was also found to reduce the severity of current depression, with an average 37% reduction in symptoms. It is being taught widely in the private sector with qualified MBCT teachers delivering courses in parish halls, workplaces and beyond.